Not everyone will be celebrating Christmas but my family does. It’s one of my favorite days in the year, because extended family and friends get together, eat far too much food, have the odd glass of bubbly and forget all the troubles in the world. How can that be a bad thing? This year it’s at my house and I’m busy cooking a huge turkey and my mum’s brought a ham. The weather is set to be a sunny 23C/75F and my nieces and nephews are already in the pool! I hope you’re 25 December is special no matter where you are or what you are doing. Thanks also for sharing time with me and my love of story telling. I hope to be more productive in 2016. I was ill at the beginning of this year and had three months of pretty much no output, so hopefully I’ll be sharing more snippets and releasing more stories next year. I want to wish you all a fabulously happy and safe holiday period. To get you in the mood, here’s one of my favorite holiday YouTube clips about coming home for the holidays. PLUS, as a small Christmas present for those of you who may not have read my Wicked Wagers Trilogy, book #1 TO DARE THE DUKE OF DANGERFIELD is FREE at Smashwords with this code XN47Q. Merry Christmas to you and your family. Thank you for your generosity. I love your books. I have already read Duke of Dangerfield. Happy New Year as well. Merry Christmas to you too! i’ve already eaten far too much. But hey, it’s Christmas! 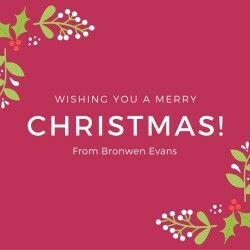 Bronwyn, Happy Holidays to you and yours.